Two-way voice communications and horn control gives workers the ability to operate with efficiency and safety, making these systems the most versatile and practical for today's logging operations. Our Grapple Base Transceiver is housed in a waterproof rugged metal case. The circuit boards are shock mounted to provide many years of reliable service. A built in voltage converter allows the base to be connected to either 12 or 24 volt yarding machines. The base is designed for easy, trouble free installation. The whistle output connects to the twin relay box on the yarding machine to give the best possible control using both whistles and two-way voice. Headsets with boom microphones are available for operator comfort and convenience. Our Grapple Portable Transceivers provide two-way voice and whistle control in one waterproof rugged package. 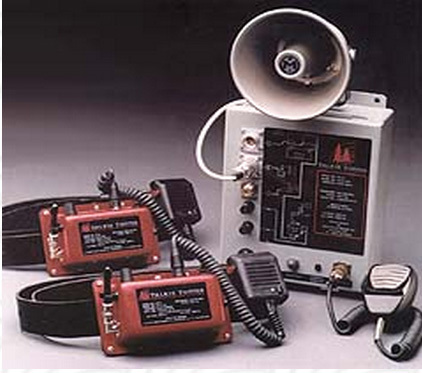 The transceiver cases are made of Kydex® and the speaker/microphone cases are made of polyurethane. Internal nicad batteries provide enough power for a ten hour shift. Whistle control is accomplished with two waterproof push-button switches. The transceivers are programmable to ensure fast turn around when frequencies must be changed.